The Disaster and Emergency Management Student's Association's primary aim is to enrich the lives and educational experience of our affiliated students (and the broader community) through social, professional, and academic programs. We aim to bring support to students in all aspects of disaster and emergency management outside of the classroom. Our goals include; education; advocacy; professional development; and fun! We will be hosting events in the coming year that will help students not only in the Disaster And Emergency Management program, but any students from the YorkU community to gain more information that will increase and enhance their education and employment opportunities. Click here to meet the DEMSA Executive Team. We would like thank all the individuals who helped make this website possible for students. We appreciate all the input and support from our various community members who contributed to the development of the webpage for DEMSA. 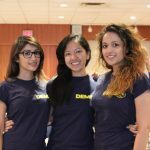 As well, we would like extend a special thank you to alumni, Zalma Sahar (content) and Chris Yew (design), of the Disaster and Emergency Management Program at York University for initiating the project and creating an online space for students to come together for useful information and resources.